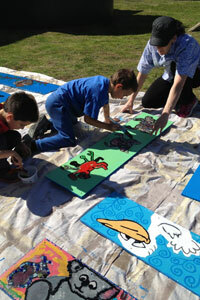 The school receives ongoing support from the Loch Sport community through multiple activities and programs. Our school is extremely privileged and proud to receive support from the wider community and engage in ongoing activities with the community. Students learn about safety through Neighbourhood Watch, participate in water safety activities with the Loch Sport Boat Club and emergency services groups. Rotary also support the school with awards, activities, donations, etc and we do our utmost to support them in return. Loch Sport Community House very generously financed our Swimming Program in 2013, which allowed all of our students to be involved. Loch Sport Lions also kindly donated funds to the school to assist students in the classroom. Neighbourhood Watch is currently running a writing competition with the school which is designed to raise safety awareness with the students. Students present a piece of work such as a poem or a poster which highlights a particular community safety issue. A winning piece is chosen each term, and then an overall winner announced at the end of the year, receives a voucher and certificate. Lions has generously supported our grade 6 graduating students for many years by providing one student per year with a School Scholarship Award. The school incorporates our award ceremony into the School Concert event so students’ achievements can be recognised in front of family, friends and other community members. Representatives of wider community organisations are invited and any additional awards such as Lions Grade 6 Scholarship and Neighbourhood Watch Writing Competition winners are announced. 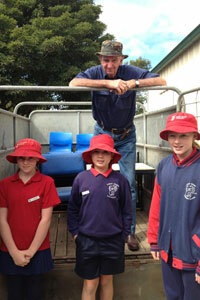 Each year the students invite a member of the Loch Sport RSL to speak to them about Anzac Day and Remembrance Day. Senior students volunteer to participate in the Community Anzac Day Service by reading a poem, and all students are welcome to march prior to the Ceremony. All students participate in the Remembrance Day Service held at the RSL, and the Senior students also read a poem. The Service is followed by a BBQ lunch provided by the RSL. Playgroup is offered at the school each Friday from 10am to 12noon, under the supervision of qualified staff from by Gippsland Uniting Care. Playgroup is not a kinder program, and is offered only during school terms in a classroom at the school. Children with parents are welcome any age up to preschool where children and parents will enjoy songs, stories.